If you want a view of Table Mountain from your Cape Town holiday or business apartment you’ve come to the right place! Mutual 811 has stunning views of Table Mountain and Devil’s Peak, as well as the city’s iconic historic buildings, such as Grand Parade, City Hall and the Castle of Good Hope. Walk from Mutual 811 to many of the best sights; stroll to Adderley Street flower market then across to cobbled Greenmarket Square and along to Company’s Gardens surrounded by museums and galleries. CBD businesses are located in this vicinity too. Visit rooftop bars, theatres and open-air cinemas and it's just a short drive to Table Mountain Cablecar, V&A Waterfront and Kirstenbosch Botanic Gardens. 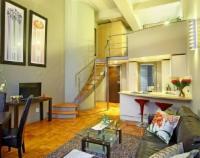 Mutual 811 has everything you want in a Cape Town self-catering apartment. It has such airy high ceilings that the mezzanine floor bedroom with a queen-size bed looks loftily over the open-plan lounge and kitchen. There’s a bathroom with separate bath and shower and lounge with TV and satellite channels, Free Wifi and 4-seater dining table. The original parquet wood floors and wall sconces are fittings from the building’s art deco past and Mutual Heights is considered the finest art deco building in Cape Town. It rubs shoulders with a street full of heritage buildings and with the grandeur of Table Mountain to the rear and the Atlantic Ocean to the front, Cape Town is one of the world’s most beautiful cities. Afribode Mutual Heights 811 is 0.6km from the centre of Zonnebloem , the nearest airport 19.4km (Cape Town International Airport).